How many ratty old 5k tee shirts do you have in your closet right now? I probably have ten. At least. Without looking, can you name any company logos on those shirts? Me neither. Philanthropy and giving back to organizations that are important to you should be part of your annual budget. With some extra effort and creativity, you can integrate your sponsorships with your marketing strategy. 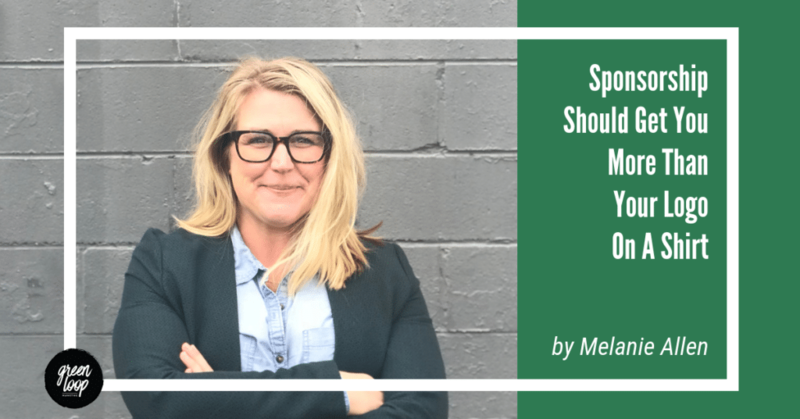 These sponsorship best practices will ensure you’re on the right track. Your first contact with the organization will likely be a fundraising or business development professional. Their job is ultimately to sell you on giving money to their organization by way of sponsorship. But, unless the organization is crazy small, it’s unlikely that the fundraising lead is also the social media and email lead. Let your contact know that you’d love to talk through collaboration and support on social media with their marketing coordinator. Fundraisers are usually more than happy to make this introduction, but they probably haven’t thought of it since most people don’t ask. How can you best support the organization and the event through social media, blog content, and email marketing? Can you access marketing imagery and logos created for the event? If none are available, can you create some for your company to use? Will a Facebook event be created? If so, can your company be listed as a co-host? If you’re sponsoring an event, you may be able to have a company presence there. Explore what that looks like. How can you make it cooler than another boring booth with a boring tablecloth and boring pamphlets? Check in with the organization to see what past sponsors have done and start there. Think about events you’ve attended in the past. What stood out? Could you sponsor the event photobooth? What about sponsoring the bar and creating a signature cocktail? Consider things that people are drawn to and brainstorm ways to capitalize on that. 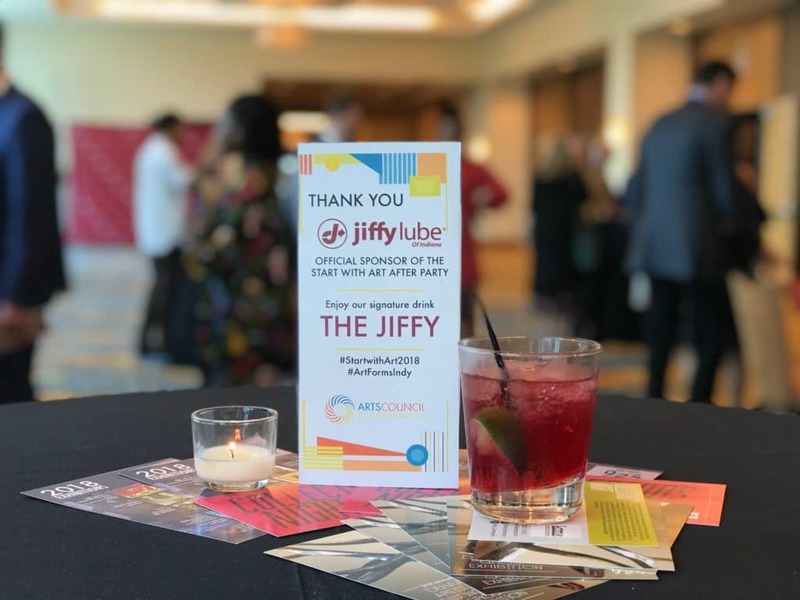 Jiffy Lube of Indiana [client] recently sponsored the happy hour after party at the Arts Council of Indianapolis’ Start with Art luncheon. To make a larger impact, we created a signature cocktail called The Jiffy designed around the brand’s colors! If done thoughtfully, swag bags and giveaways can be a great way to get noticed. But skip the flimsy coupons and think of something that makes an impact. This is especially important if you’re buying a table for an event or having team members join you on site. Empower your team to best represent your company and your involvement by sending out a few quick talking points. They’ll be able to chat with other attendees about the organization and why you’re sponsoring. Making those connections in conversation can go a long way. If you have access to the social media kit, forward that on to your team so they can share posts and photos on social media, too! Create some content that talks about the event or campaign and why you’re proud to support it. This is a great time to highlight the mission of the organization. What type of work do they do? Who does their work support? And (most importantly!) why does this work matter to you? Bonus points if you include additional ways that readers can help the organization. Once your content is created, whether it’s a landing page or a blog post, push that content out in your email campaigns and on social media. Refer back to the social media kit referenced above to make sure you’re tagging everything properly. Though you’re sharing on social media and tagging the organization, it’s never a bad idea to follow up with your contact via email and give them the link to the post or landing page. Determine if there are any other ways you can help spread the word. Most savvy organizations plan to give shoutouts to their sponsors leading up to and during the event. Ask about how your company will be highlighted. When you create blog content and post from your social channels, it makes it an easy win for the organization to share or retweet your post. They’ll leverage the content and you’ll get mentioned (and hopefully score some site traffic). Remember that nonprofit teams are small and most employees wear more than one hat. Even with these content and social media slow pitches, they may not promote and share your involvement as much as you’d like (or even at all). That’s a bummer, sure. But you’re still able to share your involvement on your channels. And if that’s not enough, then it may be time to rethink why you choose to be a sponsor anyways, ya know? 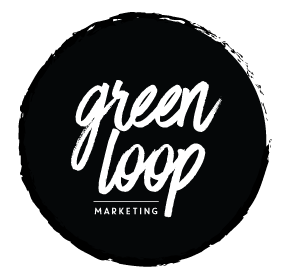 Green Loop Marketing is a marketing agency located in Indianapolis, Indiana. We combine solid social media skills with great content, community outreach, and strong overall strategy to drive visitors to your website or place of business. I’m a nonprofit professional so great info for those of us on the “other side” to keep in mind. My organization is small (less than 10), and we don’t have a communications or marketing person so anytime a company can help provide marketing, pr and social media support (via staff, content, etc.) we are happy to share it with our followers and supporters and highlight their valuable support of our program/event. If you haven’t already done so, this would be a great topic at a nonprofit conference. Hi Chris! Melanie Allen here (also a huge fan of Meghan Martin!) Thank you for reading! We LOVE the idea of a mini-conference or lunch and learn for local nonprofits here in Indy. As someone out of state, I’d love your thoughts on a webinar. Do you think that’d be of interest as well?